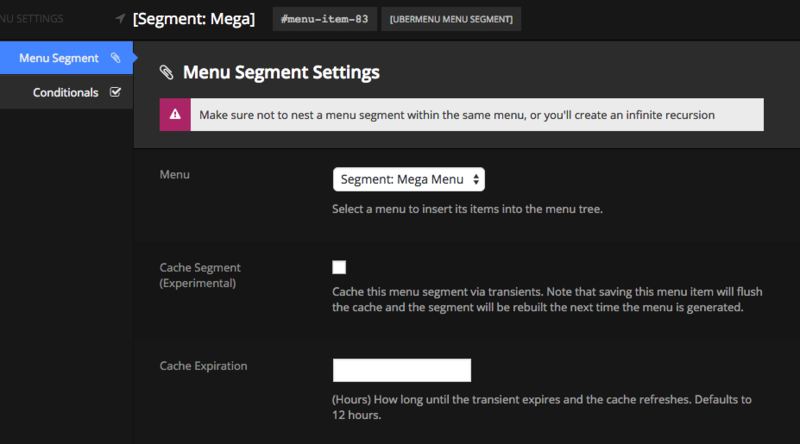 Menu Segment Caching is a new feature in UberMenu 3.2.1. It allows you to cache the output of a Menu Segment as HTML stored as a transient in the database. Generally the best way to leverage Menu Segment Caching is to use one Menu Segment for each submenu. This way, you can effectively cache each submenu independently. That means your top level items stay dynamic (features like current menu item, etc, will still work there), while you save processing in your submenus). This is especially effective if you use Dynamic Items in your submenus, as it allows you to cache the results of those queries rather than re-running them every page load.